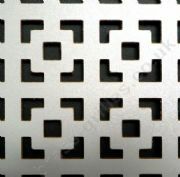 MDF and metal decorative grille panels, ideal as decorative radiator grilles for radiator covers, as cabinet door panel inserts, custom ventilation and for general interior design and home improvement screening uses. 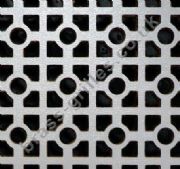 Quantity discounts apply to most perforated screening panels. 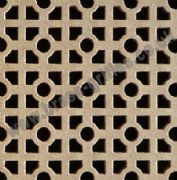 Cooden 20mm diamond hole decorative MDF screening panel in natural / unfinished 4mm MDF. 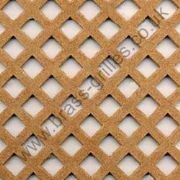 Nevada 10mm diamond hole decorative MDF screening panel in natural / unfinished 4mm MDF. Fleur De Lys (27mm tall) Decorative MDF Screening Panel in natural / unfinished MDF. 10mm Club design decorative screening panel in natural / unfinished 4mm thick MDF. Anodised aluminium 15mm small Fleur De Lys design decorative grille, producing a satin silver finish. Anodised aluminium 28mm tall Fleur De Lys design decorative grille, producing a satin silver finish. Ashford decorative screening panel in natural / unfinished MDF. Small club (6mm) design decorative grille in anodised bronze aluminium producing a satin finish. Canterbury, small 6mm club pattern decorative sheet grille in gold anodised aluminium. Quantity Discounts: 2 = £36.75, 3 = £35, 4 to 9 = £34, 10 to 50 = £32.50 (Each, including vat). Chain Link design decorative mild steel grille in hard wearing antique gold colour powder coated finish. Sold by the sheet or cut to size. Chain Link design decorative grille made from mild steel in a powder coated pewter effect finish. Club 10mm design oak veneered MDF grille decorative screening grille panel. High quality antique copper colour powder coated decorative metal grille. 18mm Cross Shaped decorative screening panel in natural / unfinished 4mm MDF. Small club (6mm) design decorative aluminium grille in plasticote white finish. Decorative grille in 10mm club design antique copper powder coated mild steel. Decorative metal grille in 27mm cross design made from anodised aluminium in a satin silver finish. International delivery available for most products. How much is delivery and how do you deliver? What is the delivery timescale for your products? Can you cut your grilles to my required size? How do I cut Grilles to my required size? Can I obtain a VAT receipt?